Prascend for Horses There are 2 products. What is Prascend for horses? Prascend Tablets contain 1mg Pergolide. 1mg Prascend is used as a treatment for cushings disease in horses. A small benign tumour in the pituitary gland causes an increased release of cortisol from the adrenal glands causing equine Cushing’s syndrome. How does Prascend Equine work? Pergolide is a synthetic ergot derivative and is a potent dopamine receptor agonist. As with other dopamine agonists, pergolide inhibits the release of prolactin. In horses with PPID, pergolide is believed to exert its therapeutic effect by stimulating dopamine receptors, and has been shown to decrease the plasma levels of adrenocorticotropic hormone (ACTH), melanocyte stimulating hormone (MSH), and other pro-opiomelanocortin peptides? What is Horse Prascend used for? Prascend tablets are used to control equine Cushing's disease (also referred to as hyperadrenocorticism). Cushings disease in horses can cause many symptoms. Clasically horses become more hairy and require more clipping than usual. Affected horses often develop a pot-bellied type appearance and can develop fat pads around the face and eyes in particular. Cushingoid horses are also more prone to lameness, laminitis is a particular problem. Other symptoms include an increased thirst and appetite, increased urination and increased infections. For example, wounds may take longer to heal than would be expected. Clinical improvement with Prascend is expected within 6 to 12 weeks. Some horses may respond clinically at lower or varying doses, and it is recommended to titrate to the lowest effective dose per individual based on response to therapy, whether it is effectiveness or signs of intolerance. A small number of horses may require doses as high as 10 µg/kg per day. In these rare situations, appropriate additional monitoring should be implemented. ? 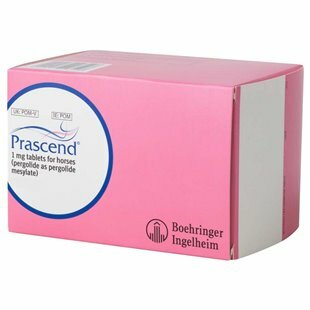 Prascend tablets may be administered orally by dissolving the tablet with a small amount of water and/or mixing with molasses or other sweetener; taking care to rinse the dosing apparatus with water to ensure entire dose of prascend is administered; use immediately. Most horses respond to prascend therapy and are stabilised at an average dose of 2 µg/kg. How is horse Cushings diagnosed? In some cases, vets may make a diagnosis of Cushings based simply on a clinical examination and an appreciation of the medical history of the horse or pony. In many cases however, your vet will want to take one or more blood samples from your horse in order to measure blood levels of various hormones or markers. The results of these tests can then be compared to "normal" ranges for the horse population, to confirm the presence of absence of the disease. Although a range of blood tests are available to assist the diagnosis and monitoring of cushings, the two most commonly used tests are: the Resting ACTH test – where a single blood sample is taken to measure the level of the hormone ACTH which is abnormally high in untreated cushings cases the Low dose Dexamethasone suppression test – where blood samples are taken before and after administration of a small dose of dexamethasone, to look for a "normal" response. Prascend is a POM-V medication. A veterinary prescription must be provided prior to dispatch. Pituitary pars intermedia dysfunction (PPID) is more commonly known as Cushing’s disease, and is a condition that can affect a wide range of mammals including horses. The condition in horses and ponies is caused when a tumour (known as a pituitary adenoma) develops in the pituitary gland, which interferes with the gland’s natural regulation of a stress hormone called cortisol. Cushing’s disease leads to the body producing an excess of cortisol, a naturally produced corticosteroid, which has a range of wide-reaching and varied effects on the body. If your horse or pony has been diagnosed with PPID, it is important to learn about the basics of the condition, and also a good idea for all riders and horse and pony owners to be able to identify the symptoms of the condition. We will cover these factors in more detail within this article. What are the symptoms of pituitary pars intermedia dysfunction in horses and ponies? Weight loss or loss of condition for no obvious reason. Laminitis, particularly if this is recurrent. An abnormally long and dense coat, particularly if the coat appears wavy or curly. Inexplicable changes in the build and conformation, such as a pot belly accompanied by muscle wastage along the neck. A particularly propensity to pick up minor ills and infections, and slower than normal healing times and additional complications with healing. How is PPID in horses and ponies diagnosed? If you spot any of the above symptoms in your horse or pony, particularly if they progressively worsen over time, it is important to get your vet to come and check your horse over in order to get a firm diagnosis, and rule out other potential causes. Your vet will talk to you about the symptoms that you have identified, examine your horse’s clinical history, and perform a full physical exam on your horse too. Generally, your vet will also need to take a blood sample from your horse and run a complete blood panel to diagnose the condition definitively, and work out the best way to proceed with treatment. Can PPID be cured or treated? Pituitary pars intermedia dysfunction or Cushing’s disease cannot be reversed or cured per se, but there are a variety of options available to you to manage the condition, improve your horse’s quality of life, and keep the disorder in check. A medication called Prascend is one of the most commonly prescribed medications, which serves to regulate the pituitary gland’s cortisol production and keep it under control, and this medication needs to be given daily by mouth. Once treatment begins to take effect, your vet may review or reduce the dosage that your horse is given. Other medications may be considered too, including Bromocriptine and Cyproheptadine, although these are not as popular or generally, as effective as Prascend. Once your horse or pony has been diagnosed with PPID, your vet will usually need to return to see your horse every few months to check the progression of the condition and how effective their medication is proving to be, and make any adjustments as needed. It is important that a horse or pony with PPID is kept at a suitable weight, as obesity and weight problems can exacerbate the condition. This may mean that horses that are usually kept partially or fully out on grass will be unable to graze freely after diagnosis. PPID also serves to weaken the immune system of the horse on the whole, and so it is vitally important to check your horse over daily for scratches or other minor injuries, and these must be scrupulously cleaned and taken care of to minimise the possibility of an infection developing. PPID also makes affected horses and ponies particularly prone to laminitis, which again, means that it is important to keep your horse’s weight under control and keep them away from lush, green pasture. You should inform your farrier of your horse’s diagnosis, as this information will help them to take proper care of your horse’s hooves, and spot the early signs of an impending problem. Even if your horse or pony is not shod, it is important to arrange farrier visits regularly, in order to improve the chances of your farrier picking up on a problem early on. When PPID has been brought under control and your horse or pony returns to their previous good condition, they should still be able to be ridden or otherwise work normally, providing that the rider makes allowances for the condition, and is alert to the signs of impending problems.